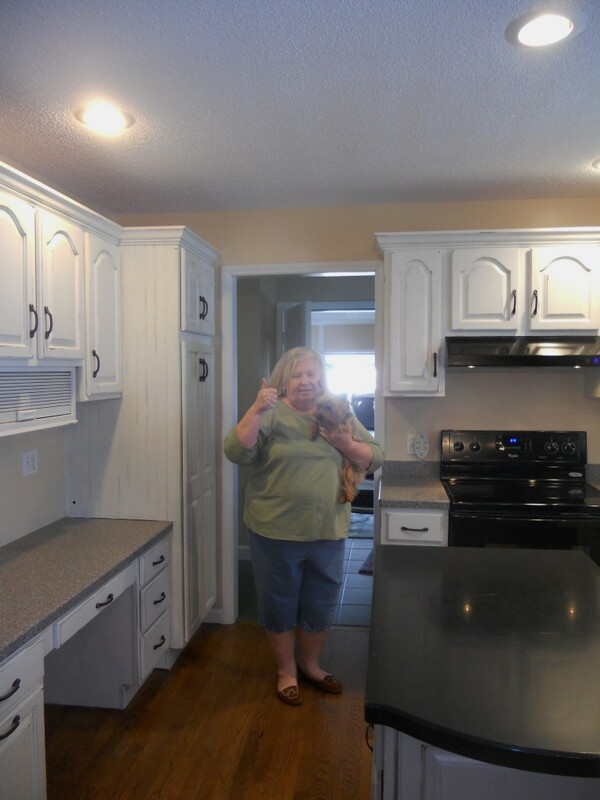 Our happy client giving her new kitchen “the thumbs up”… (McGee agrees, he likes it too)! 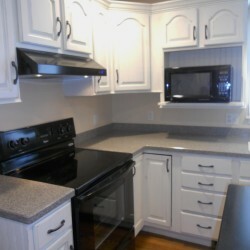 A photo of the finished kitchen. 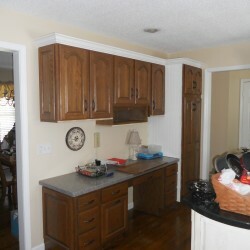 The wall cabinets are in the Beachside Cottage finish and the island is a nice shade of gray with a chocolate walnut glaze. This look is by far the most popular right now. 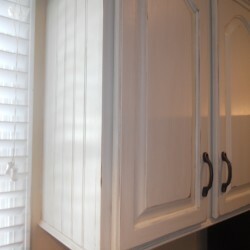 This kitchen marks the fourth in a row for the finish I call Beachside Cottage painted kitchen cabinets white with glaze. It is a versatile look that can go in many directions- certainly a “beachy” look, whether it is a weathered New England feel or something more “Gulf”, whimsical and fun. 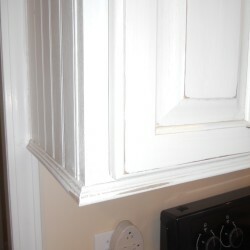 The finish also lends itself to a romantic cottage shabby chic look or country French. 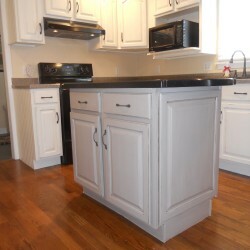 Other colors and accessories can take it into many directions. 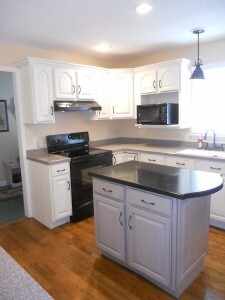 To add contrast the client chose to have me paint the island in a nice shade of gray with a chocolate walnut glaze. 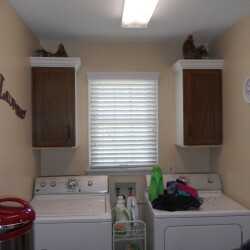 In this “before” photo you can see what a difference it made in making the space feel lighter. 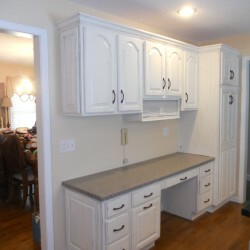 The client priced new cabinets with a finish similar to the one we did for her, the estimate of cost to replace her cabinets with the same layout…. over $15,000! 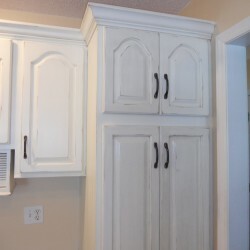 Vintage Chic Painting was able to give her a more custom look, one that she liked better for less than 1/3 of what new cabinets would have been. 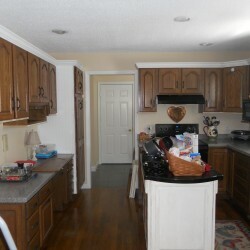 She says that the “Beachside Cottage Painted Kitchen Cabinets” we did for her were far more beautiful than what she was considering buying. 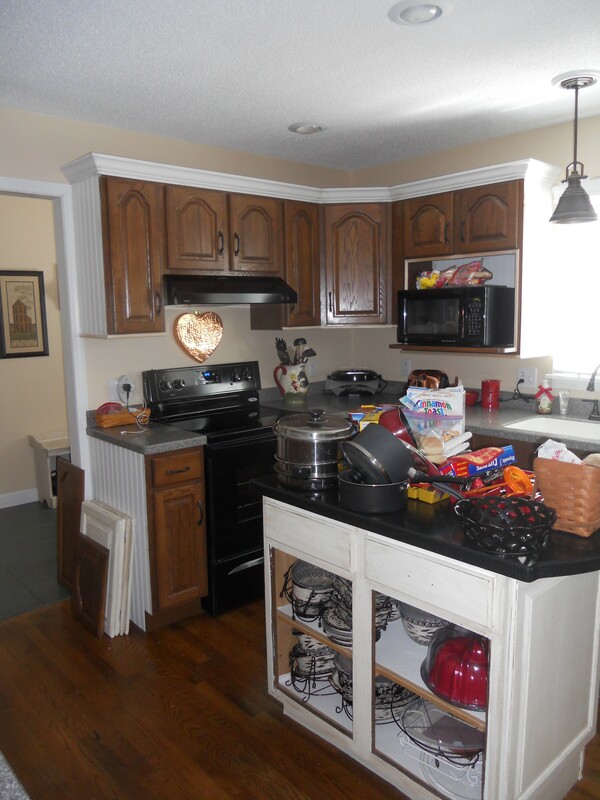 See more photos of this project and “before” photos in the gallery below. 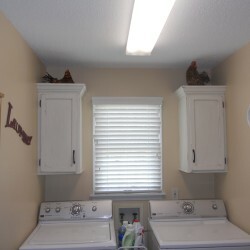 Click on each photo to view full size. 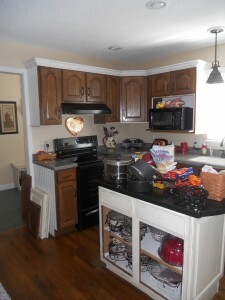 Ready to start your kitchen transformation? 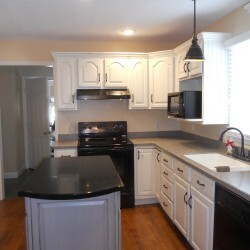 Email or call today to set up your free in home estimate and consultation! Beach side Cottage Finish- Click on image to see more of this kitchen project.